AND, in addition to your search results, you will also have the option to get a daily email alert showing you any BRAND NEW LISTINGS that matches your search immediately upon being entered into the MLS database by the listing Realtor It doesn't get any better than this for finding HOT NEW LISTINGS before other home shoppers! MLS AREA# MAP Used by Realtors. Each section has an MLS Area#. See instructions below map. * 1. OPTION 1: USE MAP# LOCATIONS: You will notice 5 boxes BELOW marked "MAIN #". Check either Box MAIN#1, MAIN#2, MAIN#3, MAIN#4, or MAIN#5 for LARGE area selections, OR check the "individual" boxes found below the MAIN heading boxes if you wish to pinpoint more exact map locations of interest. The map area numbers are found at the end of each line in parentheses. TIP: Checking more than 1 or 2 "MAIN #" boxes is NOT recommended since you may get HUNDREDS of homes as far apart as Grand Isle and St. Charles Ave! MAIN #3 ***ALL THE SAINTS/RIVER PARISHES (MLS Areas 31-36)*** (Not shown on map. Located on West side of map out of view) Can go to my home page and click on MLS Map from top menu. 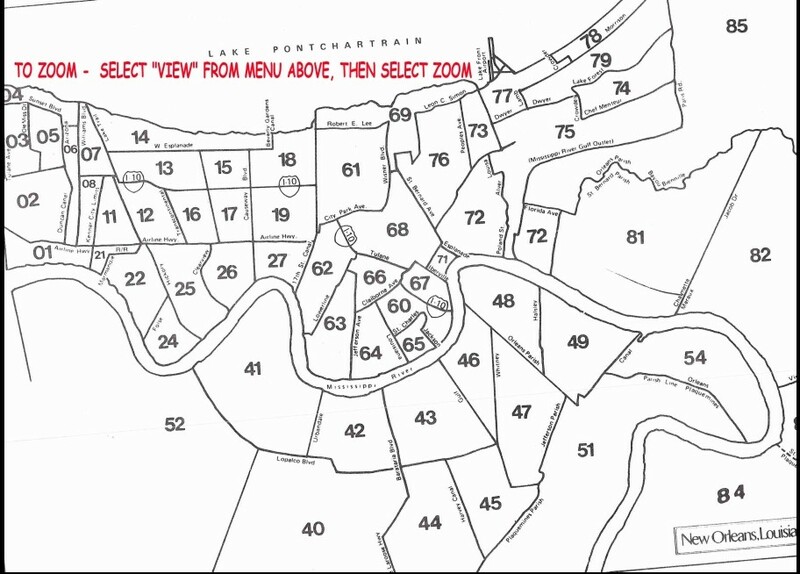 MAIN #4 ***SOME ORLEANS PARISH*** - (MAP Areas 60-71) Does NOT include Eastern New Orleans. See next Main #5 for that. * 2. ... OR OPTION 2: -USE THIS POSTAL ZIP-CODE / FREE-STYLE OPTION TO SEARCH: Type one or more ZIP-codes in box OR name a particular subdivision or area. Just let me know where to search. EXAMPLE: "I need something within 1 mile of Tulane Univ" or "Just Chateau Estates Subdivision" or between certain bounding streets. * 3. How Many Bedrooms & Baths? TIP: Select the LOWEST amount you MUST have. This will increase the number of homes found. Also, some may have extra 1/2 baths. TIP: "Average+" condition will give you more homes that match search, but will need repairs and updates. But remember, whichever condition you choose, you get those homes PLUS all homes in better condition as well. * 6. FEATURES I ABSOLUTELY "MUST HAVE" such as: OVER 2000 SQ FEET, POOL, REAR YARD ACCESS FOR BOAT, GARAGE or CARPORT, etc. TIP: LEAVE THIS BOX BLANK UNLESS YOU ABSOLUTLY "MUST" HAVE IT. The number of homes found will decrease as you add search restrictions here. * 7. When would you like to move? 0 to 2 months! Donna please call me to look at houses. I am ready! I am just curious, but if I found the right home I might consider a move. Send homes that match now, AND also the 90 day email alert for any brand new listings that match my search later. No Thanks. I do NOT want the free email alert. Just send the homes that match now. I do NOT have an agent. Donna, please call me to discuss more about the location or type of home I am looking for. Or I would like to talk about financing that might be best for me. I do NOT have an agent. I will contact you Donna if I should want to preview a home. I have an agent that I am satisfied with at this time, but will keep you in mind for future real estate assistance.